The Low Countries, situated in the west of the island, fell under control of colonist invaders in the early 17th century. The Kingdom of Kandy was situated in the highlands of the central and western part of the island. Here, Sinhalese culture survived relatively undisturbed for two more centuries until their capital, Kandy, was finally overrun by the British in 1815. Among connoisseurs of the arts of Asia, the Kingdom of Kandy is well-known for it's outstanding metalwork and their incredibly fine carving of natural materials like ivory, horn, coral, and wood. 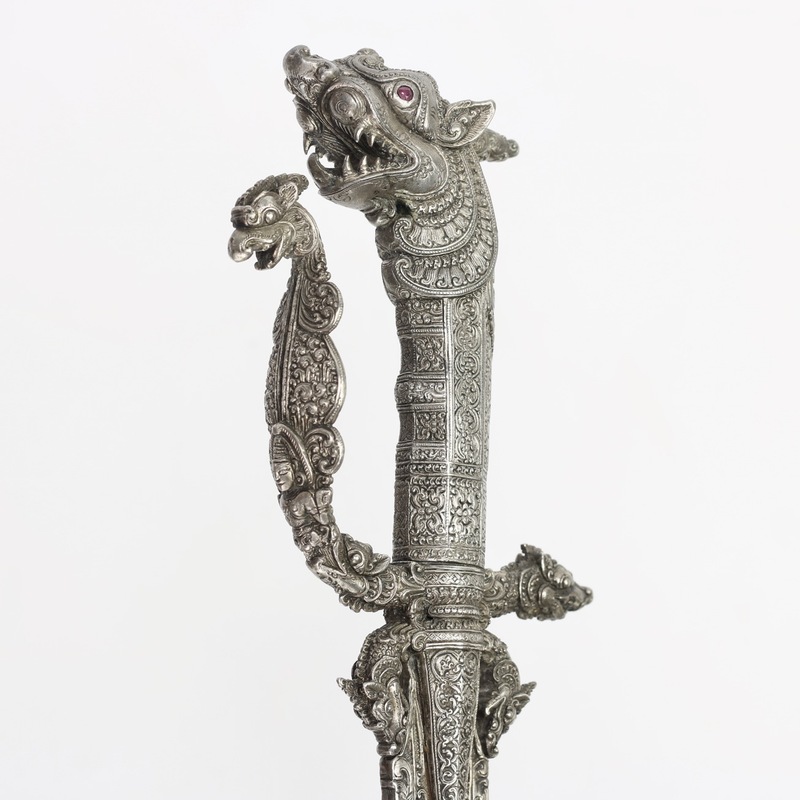 During the height of Kandyan craftsmanship in the 18th century, their workshops produced some of the finest and most complex works of handicraft of Asia. First, the kasthāné of Kandy that were made in the royal workshops of the King, who bestowed them upon noblemen and local chieftains as symbols of rank and office, or as gifts to diplomats. 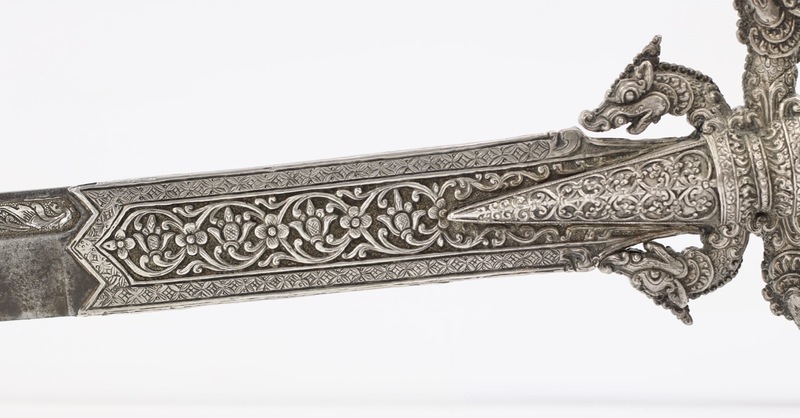 These typically have a highly ornamental hilt of gold, silver, of horn, such as this one. The blades varied from short to long, light to heavy, but all tend to have functional blades that were at least capable of fighting. Second there were pure fighting pieces, often quite heavy, following the same general style as the first class but with only rudimentary decoration. Third, there were the kasthāné of the Low Countries. These were made under foreign control to be bestowed on local puppet leaders. They tend to be short, light and purely ceremonial. 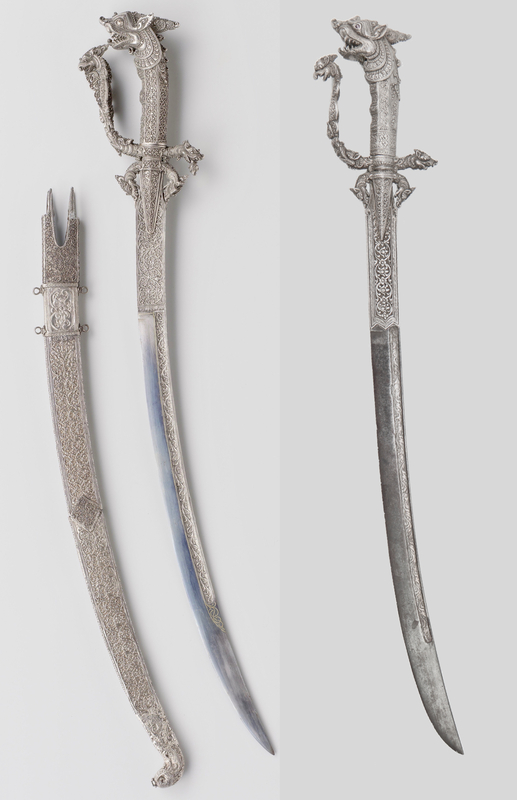 Although technically well-made, they are out of proportion, look somewhat clumsy and lack the aesthetic appeal of the swords made in the Kingdom of Kandy. 2 After Kandy fell to the British in 1815, only this type remained in production. 1Stone, George C., A Glossary of the Construction, Decoration and Use of Arms and Armor: in All Countries and in All Times. (Reprint) Dover Publications, 1999. Page 339. 2De Silva, P.H.D.H & S. Wickramasinghe, Ancient Swords, Daggers & Knives in Sri Lankan Museums, Sri Lanka National Museums, 2006. See pages 145-175 for a variety of kasthāné from the Kingdom of Kandy and the Low Countries. Blade thickness: 6mm at base, 7mm at end of ornamentation, 4.5 mm middle, 4.5 at tip. A beautiful Sinhalese kasthāné from the Kingdom of Khandy. 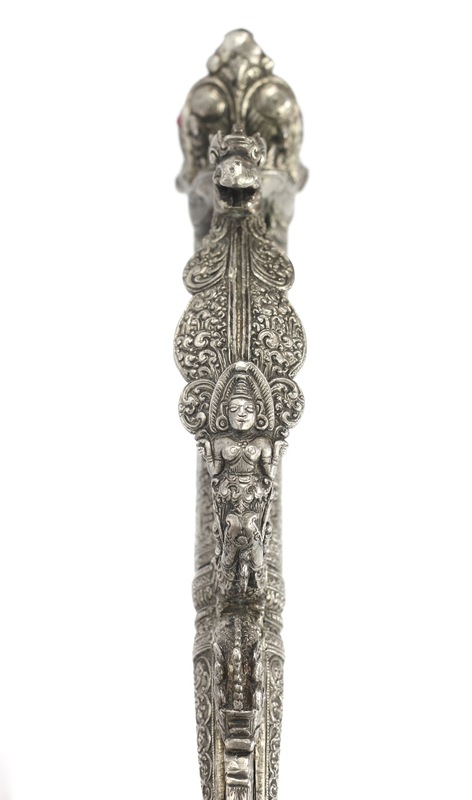 Sinhalese swords and daggers are primarily collected for the craftsmanship and aesthetic appeal on their hilts. 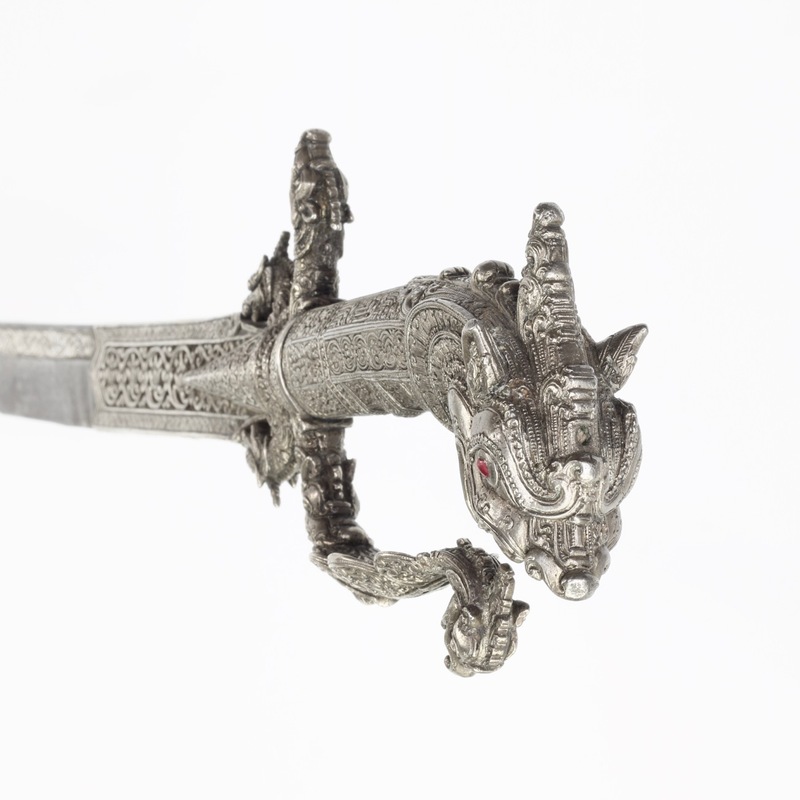 This spectacular hilt is entirely made of silver, and shaped with many mythical creatures. 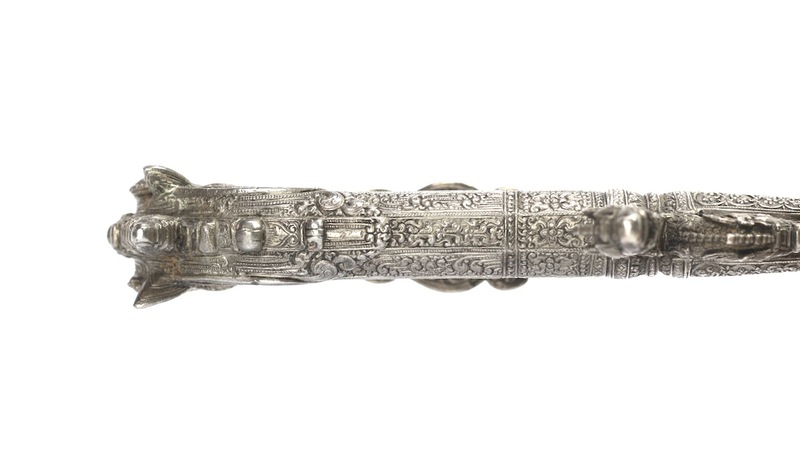 The main attraction is the pommel which consists of a very stylized lion head. The lion, called simha , was the national symbol of the Kingdom of Kandy. It is very finely articulated with a sweeping crest, pointy ears, tongue, and layers of stylized manes. Its eyes are rubies. The facetted grip has two cutouts for the fingers. Its surface is engraved with various traditional Sinhalese motiffs such as liya pata (curly motifs) and liya vela (circular repetitive vine-like motifs), and flowers. 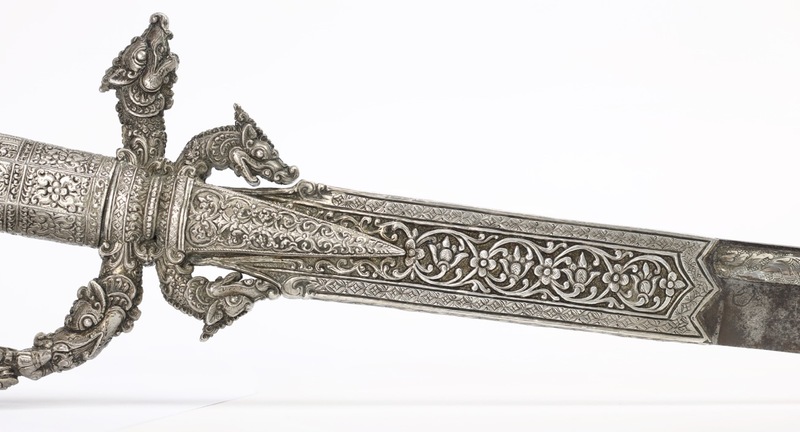 The blade is held firmly in place by two thick, triangular langets that are -again- elaborately carved. 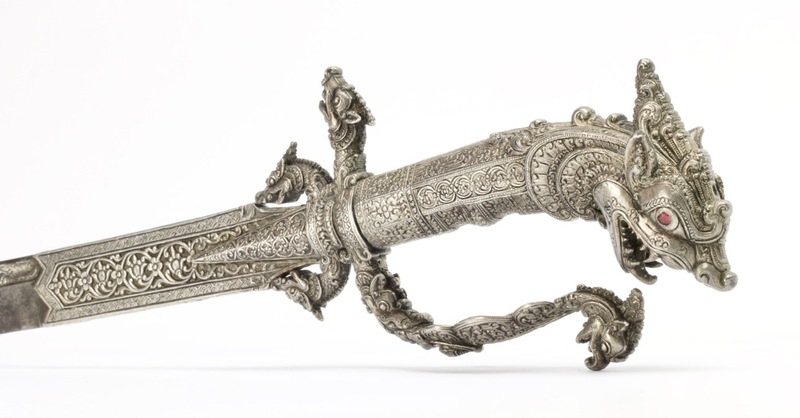 The forte of the blade is overlaid in silver sheet, elaborately chased and chiseled with liya vela with lotus flowers and geometric borders. There is a remarkably similar kasthāné in the collection of the Rijksmuseum here in Amsterdam. Accession number NG-NM-7112. It was believed to be taken from the castle of the King of Kandy by the Dutch V.O.C. in an attack and looting that took place in 1765. The sword is mentioned in the inventory of Baron Lubbert Jan van Eck, Governer of Dutch Ceylon who died in office in that same year. Left: Rijksmuseum accession number NG-NM-7112. Right: Our kasthāné . The Rijksmuseum records state that it was believed to have been among the personal possessions of the King. 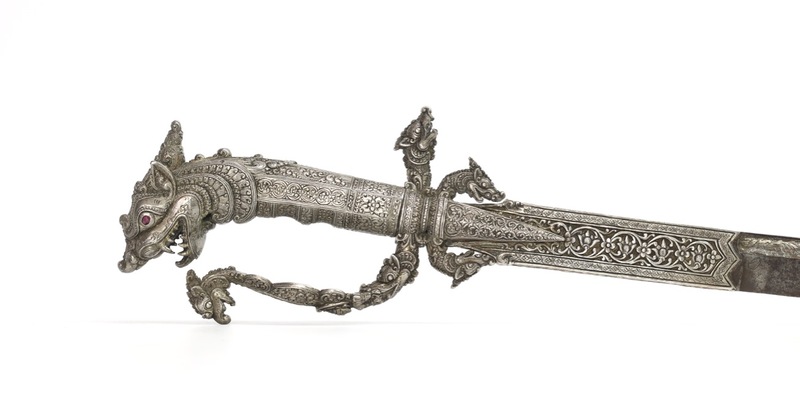 The King of Kandy was the only one who was entitled to wear a golden mounted knife and sword, and among the artifacts taken are indeed a golden kasthāné and golden piha kaetta (knife). 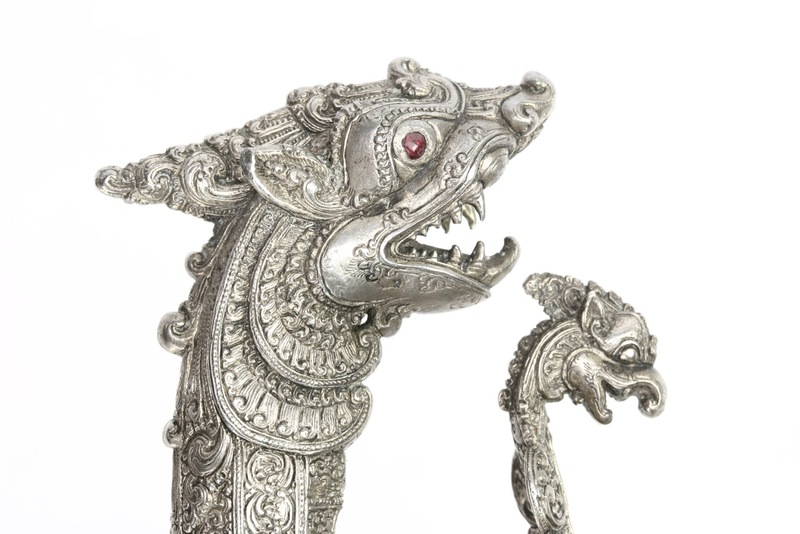 The completely silver-clad kasthāné were worn by the highest officials, the Adigar who were basically fuedal lords that also acted as ministers. Their swords were made for them in the King's "four workshops" and presented to them by the king himself when they assumed office. 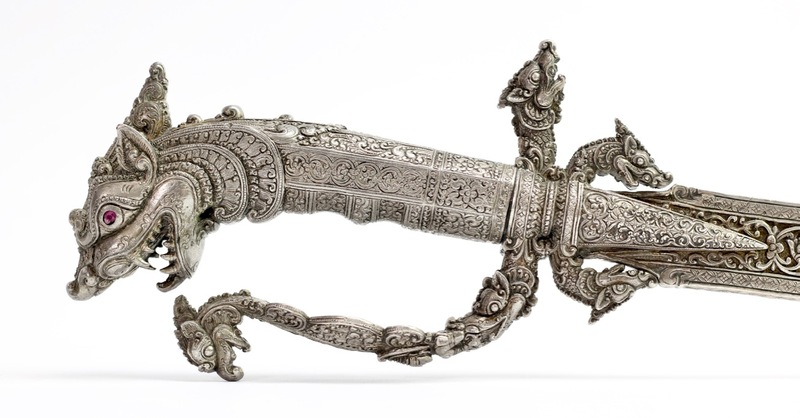 The silver kasthāné in the Rijksmuseum, and the one I present in this article, may both be commissioned by the king of Kandy to be presented to Kandy's highest officials. Otherwise, perhaps not all the king's kasthāné were clad in gold, and he may have owned a few more modest examples for different occasions. 1For an excellent overview on identifying the creatures in Sinhalese art see Coomaraswamy, A.K., Mediaeval Sinhalese Art, Pantheon Books, Second Edition, 1908. (1956 reprint). Pages 80-90. 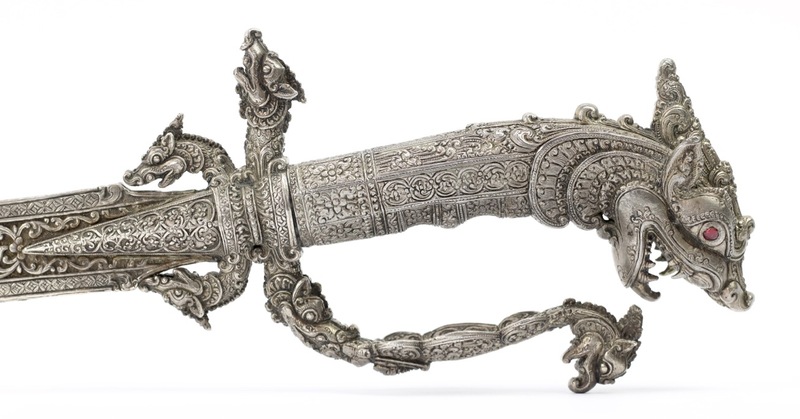 An exceptionally fine Sinhalese kasthāné with all-silver hilt. It is remarkably similar to a piece taken by the V.O.C. from the royal palace in the Kingdom of Kandy in 1765. 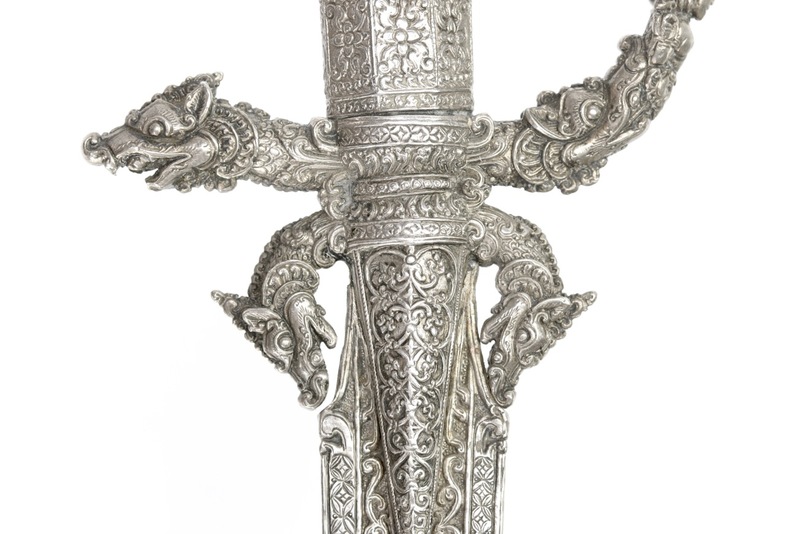 Such swords were commissioned by the king himself to be presented to Adigars , Kandy's ministers, when they assumed rank.